This is not you. This frail, bent form, struggling for each breath, waiting to die. The cancer, emperor of all maladies, has been coming, maybe for years, but mercifully it spared you its worst evils until very recently. Diagnosed in late July, you kept working until mid-August, and only in the last three weeks have you suddenly fallen off a cliff and lost your spark, your energy, your ability. But this is not how I will remember you. I will always remember your strength, and your unending faith. Faith in God, yes, but also an unstoppable faith and belief that things could and should be fixed, improved, and set right here on earth. That my brother and I were capable of, and called to, world-improving action. That it wasn’t enough to simply attend a spelling bee, or even win it, but that we should help others prepare and succeed also. That music was a good hobby, but we should also play soccer and go snowboarding. That good grades were mandatory, but so was acting in the school play, bringing forward multiple entries at the talent show, and mucking out neighbors’ houses after the river flooded. That forms should be filled out, applications completed, and all the paperwork and minutia required in life should be handled in an orderly and timely way. That inclement weather (black ice near Hood River) should not discourage us from meeting prior commitments (recital near Spokane). That games should be played loudly, and puzzles built in one sitting. That family vacation is mandatory, and must take place somewhere spectacularly coastal or mountainous. That only the best, ripest, freshest food should be eaten (and that eastern washington orchards and gardens claim the top spot in that regard). That stories should be told, and re-told, with gusto. That events, people, and places should be Remembered with a capital R.
So, Mom, I can tell you, even though you can’t hear me, that it worked. Your faith worked. You helped me to thrive through the twists and turns of my 36 years, and I know you will always remind me to be the best person I can be, God-willing, for many decades to come. Even today, the day of your death, you gave me an amazing reminder of your strength, courage, determination, and great spirit. This morning, I reminded you that you just got home yesterday from your two-week last-resort treatment adventure in Mexico, and I mentioned that I was glad you made it home safely. They don’t tell you before you become a parent how much of a physical challenge it will be. Everyone hears about the mental challenges and the relationship stresses, yes, but physically speaking the demands are understated. Before you have kids, you think pulling an all-nighter is a pretty big deal, and you have no idea how valuable it is that you most likely have multiple chances to catch up on sleep pretty much anytime you want. Once you are a parent, things change. A single all-nighter can be handled, yes, but what about a consistent sleep interruption at 1:00 am, or 4:00 am, or both, that continues for weeks, or maybe months? I don’t care what anybody says, I think any parent, at least any parent who is attentive to their child(ren), is forced to become one of the toughest, most resilient people on the planet. The second best thing about such toughness training (second only to the experience of watching your child(ren) grow and change) is that you can take that inner strength with you anywhere you go. For example, Peru. After a week of manual labor with a 20,000 step commute each day, you can roll headlong into 60 hours of travel without batting an eye. This was my experience after finishing the water project high in the Andes Thursday night, touring Cusco Friday, and ending up in Aguas Calientes on nearly the last train of the day and getting to sleep a little after midnight. A 4:30 am wake-up call the next morning would have seemed very daunting to my younger self, but to this newly-minted parent it didn’t seem that much different from the average day. It probably helped that the early rising was for the purpose of reaching Macchu Picchu, the fantastic Incan ruins that were constructed on a ridgetop with impossibly steep slopes down three sides and which include buildings placed with incredibly accurate alignment to the movements of various stars and the sun. Because it is 2015, and world travel is probably easier than it has ever been, our small group of eight were not the only ones who found themselves stumbling in the dark through a humid pre-dawn to catch “the first bus”. Macchu Picchu currently allows about 4,000 people to visit every day, and close to 1,000 of those visitors were already in line by the time the first buses started arriving around 5:00 am. We arrived at the entry gate, no small feat after a bus ride that had to negotiate 14 switchbacks while frequently backing up to safety to allow each oncoming, downhill bus to pass, to a complete, foggy white-out. We were walking through and next to the ancient walls, and could not see any more than 10 feet. This turned out to be a blessing in disguise, as we elected to attempt the climb of Macchu Picchu mountain to see if we could rise above the fog. We reached the check-in gate for the climb by 6:45, and were not allowed to start climbing until 7:00 am. Our group were the first 8 signatures in the climb log for that day, and all of a sudden the threat of spending the day elbow to elbow with a couple thousand people vanished. We probably could have deduced that there might have been reasons why very few visitors actually summit the mountain, but I didn’t say that the parenting lack-of-sleep marathon made people smarter, just tougher. As it turns out, it is an incredible climb up to the summit! 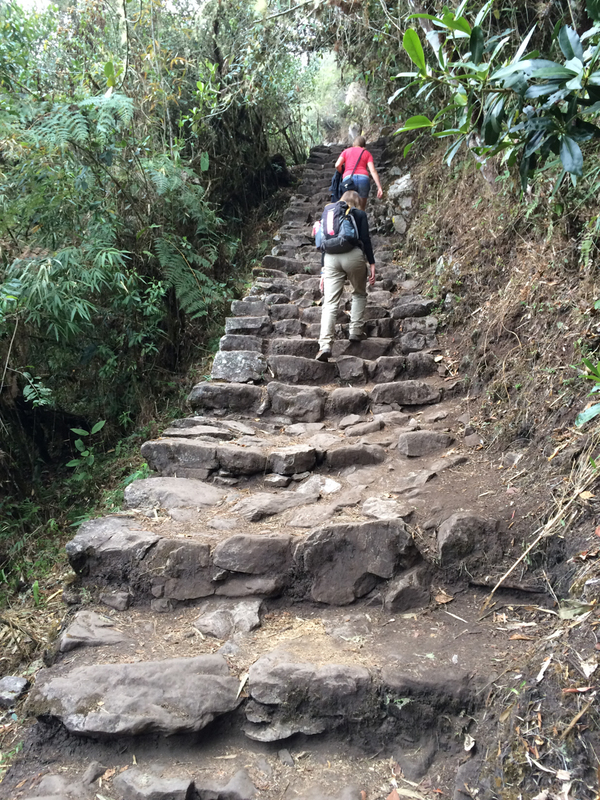 With just a few hundred feet of typical trail, the journey is mostly made up of stone steps, many hand-placed, and many just hand-cut into solid rock. I made the unfortunate decision of starting a stair count at the bottom, and by the time we reached the top nearly one hour and ~2,060 stairs later, well, let’s just say I didn’t want to be counting any more. The top, however, welcomed us with a vantage point above the clouds, and a few minutes of waiting allowed the lower clouds and fog to slowly burn off and reveal the sacred valley in some unforgettable views. At first, it was hard for me to get a sense of how serious this fire was, but as I continued to read up on the details of the worst firestorm in many decades to hit California, I realized that there was a very real possibility that our home was in danger. Unfortunately, I still had 16 hours of travel ahead of me, so there was literally nothing I could do for my family. My wife heroically packed a carful, wrestled the cat into her box (don’t laugh, it’s not easy), and got our kids and animals over to her parents’ house at 2:00 am. When I finally reached home, after providing an Uber driver with their longest fare-paying trip ever, it was still not clear whether the fire was going to threaten our town or not. Long story short, the fire has stayed away from our area, and our stress over packing and evacuating has paled in comparison to the stories of hundreds of families in Lake County, including our own family members, friends, and coworkers, who lost everything in the inferno. If you have the means, I urge you to donate in some way. 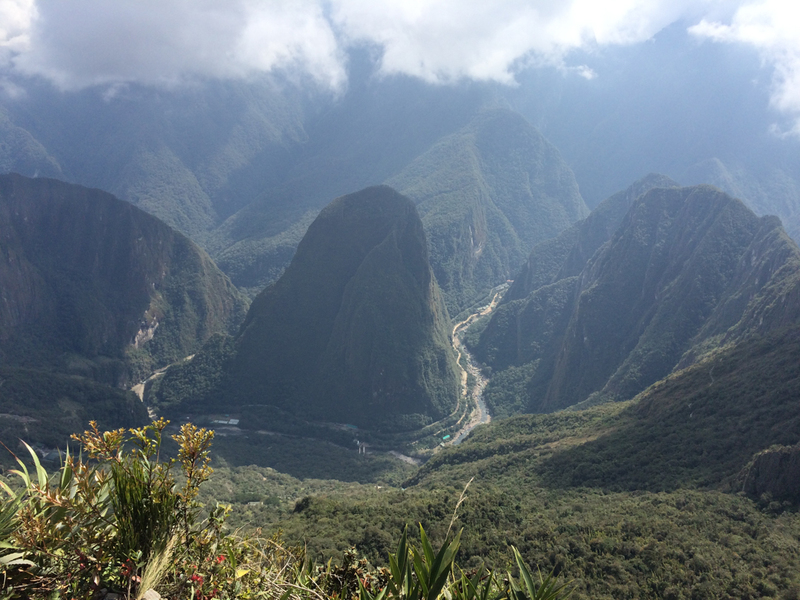 I will post separately about the project conclusion and the experience of Macchu Picchu. If you have not experienced it, it is hard to explain the simple joy of taking a warm shower after four days of hiking, plumbing, and concrete work. Even the slight electric shock provided by the exposed wiring doesn’t dampen the enthusiasm for getting clean and warm. Friday most of the team stayed at ADRA, as there wasn’t time to hike to the project and get anything done, so I took the opportunity to explore Peru briefly. I walked out to the main highway (3S), and caught a local bus for the 90-minute ride to Cusco. Amazingly, the cost was $2! 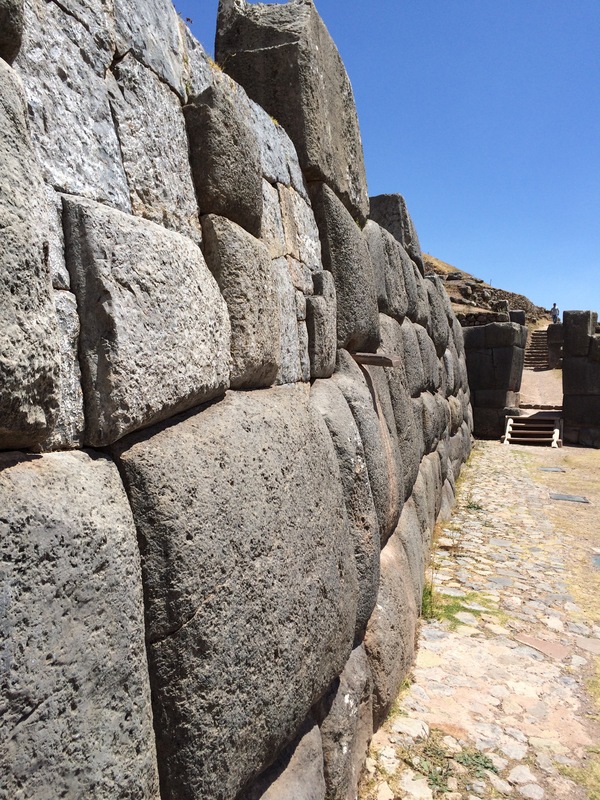 In Cusco, I had about 4 hours, so starting from the central square I hiked up to the Incan ruins at Sacsayhuaman. I think I was the only tourist walking up, and various taxis kept insisting that it was going to take me too long to get there. After the week of hiking to the project site, I just laughed. It only took about 15 minutes to walk up! The ruins were impressive, especially the huge stones used for walls, and the views of Cusco were pretty unbelievable too. After a good lunch (pasta neapolitan with a “touch of cusco”) in the Plaza de Armas, and a quick walk through the central market, I hailed a taxi for another 90-minute trip to the town of Ollantaytambo. Here I met most of our team, and after a solid dinner (one pizza each!) we caught a train to Aguas Calientes, the town at the base of Macchu Picchu. The air felt humid, almost tropical, down just below 7,000 feet, and after a trip filled with cold nights Friday night was hot. 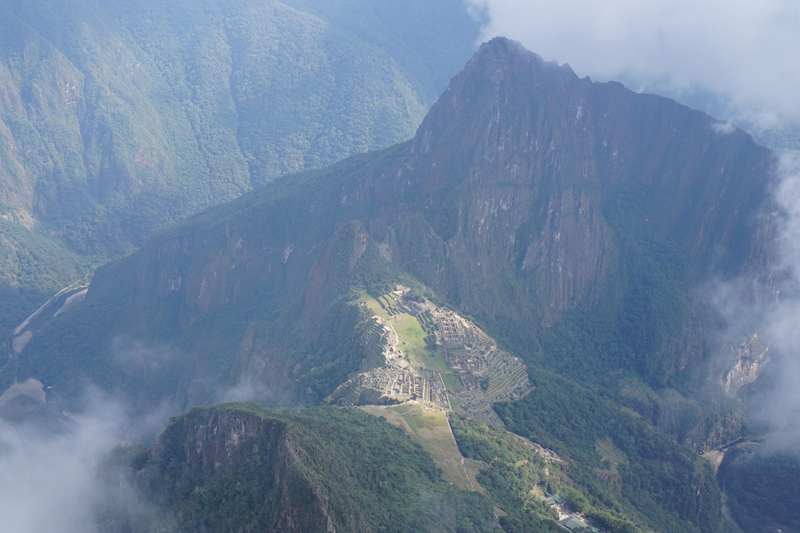 Fortunately, it was short, as we got up at 4:30 to see Macchu Picchu. Thursday started with very little remaining work: tightening a tapstand, checking and fixing leaks, and connecting the collection box to the springs. Without a hardware store nearby, these things turned out to be able easier said than done. We have had a lot of problems with the 1/2″ galvanized pipe we used at each tapstand, partly due to really rough threading done by the local shop and partly due to its propensity to shear/snap/break at the worst times. For example, while tightening the final piece of tapstand 4, the entire pipe snapped, leaving the threaded portion inside the 90-degree elbow, which was completely encased in concrete. We were able to chip away the soft concrete (16 hours old) and expose the elbow enough to remove it. Fixing the pipe, however, would require a hike down the mountain and an hour drive to the machine shop. Even if the shop were open, there would be no way to rethread the pipe, drive back, and hike to the top on that same day. So Tap 4 was out of commission until Friday at the earliest. Attempting to get back on track, we moved on and fixed leaks at junctions and tapstands through the whole system from bottom to top. Getting to the collection box, we realized that we did not have enough fittings to complete both spring connections. We had enough hardware to connect one spring, and we would have to connect the other spring on a different day. Upon connecting the spring, we realized that we had a big problem: water was passing right through the collection box and out onto the ground, instead of going down the pipe to fill tanks 1 and 2! The local workers had created the concrete forms for the spring box by hand, perched on a 50% slope, with nothing but hand tools. This was no small feat, but lacking power tools or a drill, and in an effort to get things done quickly, they had decided it was too difficult to cut holes in the forms for any plumbing other than the main tank fill line. Our design had called for three pipes out of the collection box, one for the tank fill line, one at the top for an overflow, and one at the bottom for a cleanout. For the overflow and the cleanout, they had placed small sections of PVC pipe inside the forms prior to pouring concrete. This was definitely better than nothing, but it meant that after the forms were removed we had a 1.5″ hole passing through the concrete at the bottom of the box, and no way to plug the hole with materials on hand. Any solution that we came up with involved trips to a store and/or machine shop, so at the end of Thursday we had to hike down without being able to connect the springs to the system. This was hard for me as Thursday was my last day at the project, but I’m confident that all of Thursday’s issues can be fixed on Friday! On the hike down on Thursday, a couple students offered to show me an old Spanish mine, and this turned out to be very impressive. The main tunnel, after a hundred feet or so, branched into four tunnels, and each one appeared to branch again multiple times. Basically, this was a big mine, and I have no idea how they could have carved the tunnels out of the solid rock given that the only access to the mine was basically an alpaca trail. I don’t know my minerals, and I didn’t spot any gold, but the tunnel walls had large bands of shiny blue, green, and yellow rock which looked quite amazing. 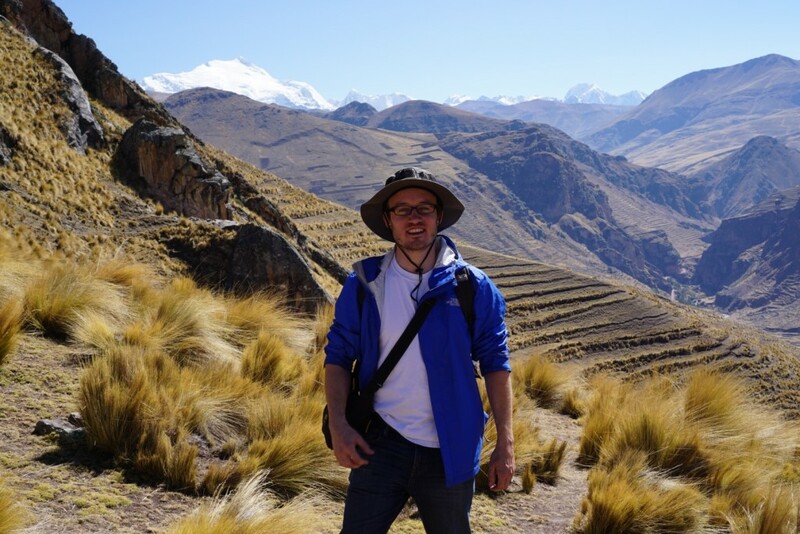 After I got over the crazy altitude (ie basically my last day there), I started to enjoy the hike to the project site, which had amazing views of Ausangate, a nearby 20,000+ foot mountain. Hiking down on Thursday, I took my time to enjoy the views, and to think about the water project. Hopefully Friday everything will be completed! Wednesday and Thursday were a blur, as we plan to complete and turn on the water system unofficially on Friday, with a community ceremony on Monday to officially turn on the taps. Our system is pretty basic, but the challenges of site accessibility, altitude, and communication (say, between someone testing a tap and someone at a water tank) mean that working out all the kinks is very time- and energy-consuming. The overall system is as follows: two spring catchment walls that capture water trickling and weeping out of the mountainside; a collection box to allow sediment to settle out of the water; 1.5″ HDPE pipe to take the spring water down to a 600 gallon tank; two tapstands below tank 1; a second 600 gallon tank below these taps; and three additional tapstands below tank 2. Wednesday we worked fast to complete concrete forms, rebar cages, plumbing, and drainage at each tapstand (see below for a partially-completed tapstand), and by the end of Wednesday the community had poured concrete for all five tapstands. Theoretically, Thursday should have been relatively straightforward with only the collection box connections and leak checking as the remaining tasks. It did not turn out to be so easy. Monday happened. It was my first hike up to the project site, and it was way more challenging than I expected. The hike starts out steep, gains 1,000 feet in less than a mile, then wraps around a couple ridges before entering the Panteneque valley, which has about 500 vertical feet between the lowest house and the springs. The altitude (from 13,100 to 14,900) makes any uphill slope of the path send your heart rate to the max, and the climb to and through the village is unrelenting. Jim, the professional mentor who had been with the team for the first week, had to leave the project site by 10:30 in order to catch his flight in Cusco. I started hiking at 7:30, but didn’t reach the springs until 9:30, so Jim and I took one hour to go over the status of spring catchments, collection box, two tanks, five tapstands, and 2,000 feet of trench. I then spent the day moving back and forth around the project, trying to understand the challenges and help if I could. The local community has contributed a huge amount of labor, including hand digging a 30″ trench for more than 2,000 feet that looks better than many trenches I’ve seen at construction sites in California. The major challenge on Monday was that we needed fittings, additional pipe, wood forms, and steel rebar at many points across the project. It took most of the day to get an accurate picture of what we needed, so we didn’t accomplish any “big” things on Monday. We did quickly redesign the tapstand bases to significantly reduce their size, saving about 2/3 of material and labor needs. Organization is progress, and it paid off on Tuesday morning as nine members of the local community showed up to help and we were ready with specific requests, mainly asking them to carry all the pipe and forms up the mountain by hand. We carried small loads of rebar, but they did amazing work getting the other items up the steep, narrow path, including working in teams of two for the huge rolls of pipe. Needless to say, their fitness at altitude is simply unbelievable, as evidenced by the fact that even elderly members take part in the carrying effort. Up at the village, they routinely carry around large burlap sacks full of sand, gravel, cement, or large rocks. 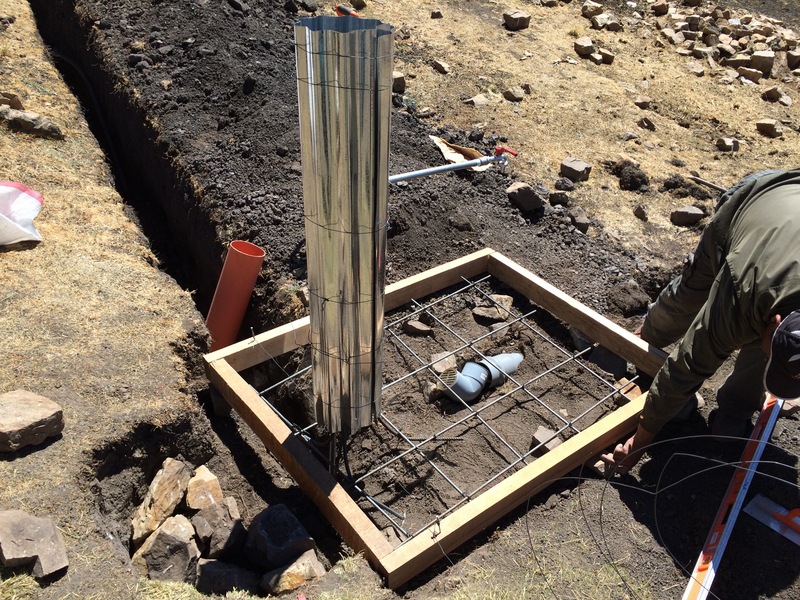 By the end of Tuesday, we succeeded in helping build forms and pour concrete for two spring catchments and a collection box, as well as getting some of the tapstand forms and plumbing in place and getting one tapstand poured. There is a reasonable chance that tomorrow we will complete concrete work on all five tapstands, as well as laying the final few hundred feet of the main water line. I have learned a lot in just two days, including the limits of my own ability. Monday, hiking up, around the village, and back down with two wrong turns and an extra mile of backtracking (20,000 steps above 13,000 feet) left me feeling that there was no chance I would be going anywhere on Tuesday. However, by the time Tuesday morning rolled around, I decided to give it a try, and did a slower hike up and was careful not to move around the village much during the day. At the end of Tuesday, I felt much better than Monday, so here’s hoping Wednesday will be even better. A highlight so far has been meeting a child who lives in the village (the only child under six, it would appear). He doesn’t speak Spanish so I don’t know his name, but I would guess he is around two years old, and he reminds me so much of both of my sons. 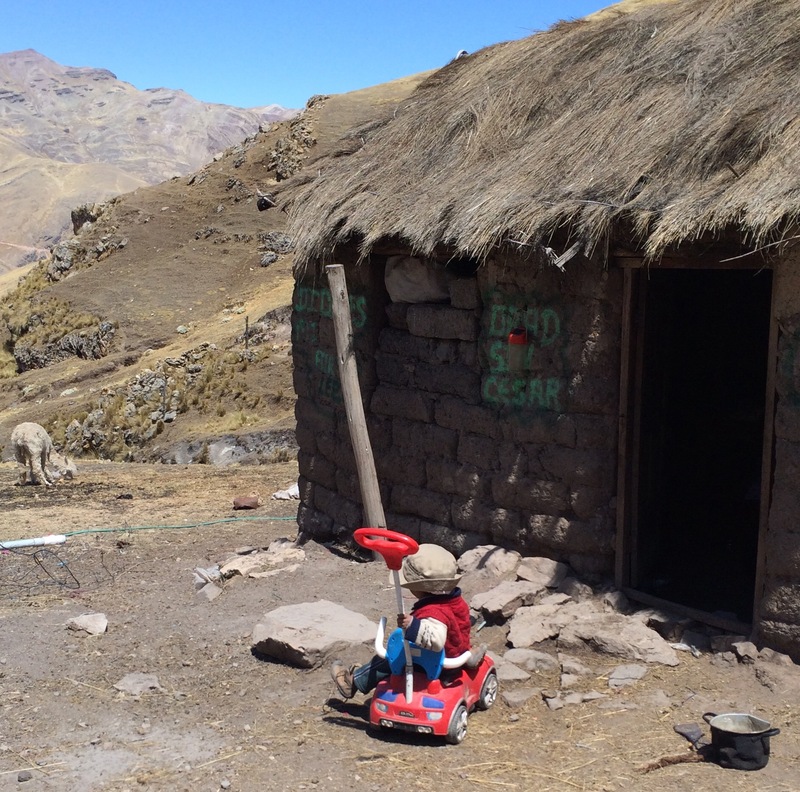 He always wears his hat & his colorful Andean coat, and follows either his mom or dad (both of whom are working on the water system) around the village all day, often sitting and watching everyone mix concrete, or build forms, or herd the alpacas, llamas, and horses. I showed him a picture of my two sons today, and he just grinned and kept pointing at them and exclaiming something happy in Quechua. I would love it if he could meet my sons and play in a park with them (preferably not at 14,500 feet), and whenever I feel tired or worn down, or pessimistic about the project’s sometimes slow progress, I keep reminding myself that in a few days I get to go home to my amazing family and live a comfortable and relatively easy life, while this child is going to grow up on a cold, windy mountain with many significant challenges ahead. If I can contribute to completing this water system and getting clean water to him, his family, and his small village, then I absolutely need to press on and give it my best. We started out the morning on Sunday with the goal of dropping off our stuff at Japura (our base camp for the week) and then visiting a nearby lake named Sibinacocha. Sitting at 16,200 feet and just below a series of 20,000 foot peaks, it is significantly off the beaten path and well worth the trip, I imagine. Unfortunately, we did not find the lake today. Our mistake was taking the trip with a local driver who had not actually been to the lake before, but promised effisively that he could get us there and back. After about 2 hours of driving gravel roads with stream crossings/washouts every couple minutes, many of which required all ten of us to exit the van so it could pass through them, we arrived at a mountain pass of 16,680 feet. 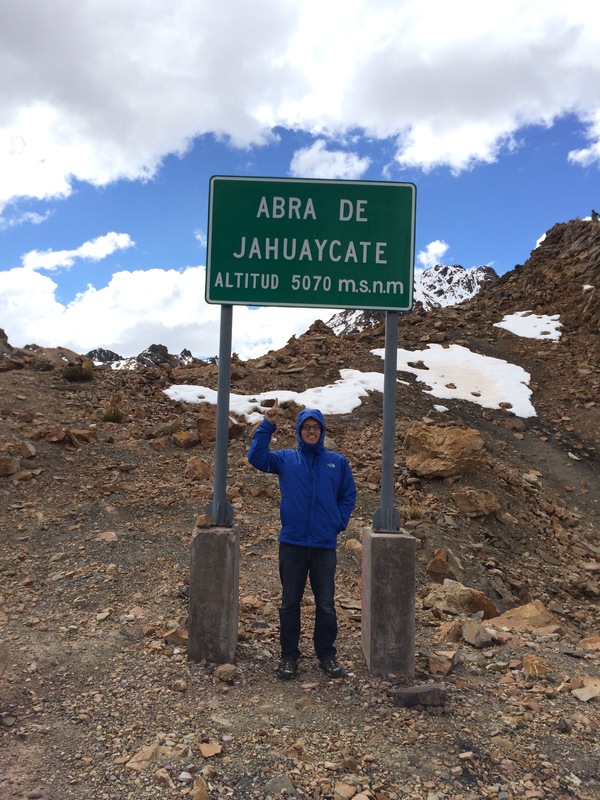 With whipping, cold winds, we did not stay long and soon descended to the relatively oxygen-rich elevation of 15,800 feet, where we passed a vicuna/llama/alpaca farm and asked the farmer for directions to the lake. He pointed to a nearby ridge, encouraged us to go around it, and then make a left to reach the lake. Our driver got the two instructions mixed up, and took a left before we rounded the ridge. By the time any of us noticed that there might have been a problem, our road had turned into a cattle track and then quickly vanished into an open plain. We questioned our driver, and he insisted the lake was “just ten more minutes” ahead of us. After we forded a river and the bumps in the plain started to become impassable for our van, we insisted that stopping immediately was the only option. Several people took off hiking to the nearby ridge, hoping to catch a glimpse of the lake, and our driver followed some alpacas back to their herder, and asked if we were close. Turns out that 30 minutes of hiking would have gotten us a lake view (and one ambitious member of our group did reach the ridgetop, snapped a picture, and practically ran back to the car), but proceeding further by van would not get us to the lake, or anywhere except further into the wilderness. Backtracking, we found the semblance of a road that took us all the way back to the main road, except a fence separated us from it! Driving parallel to the fence finally yielded an end to the fence, but we were about 3 feet below the road with no way to climb the embankment. Out of the van we jumped, and the driver made both low-speed and high-speed approaches, all of which ended with the van on three wheels, with the fourth wheel 12″-18″ in the air, helplessly spinning. Finally, the driver found an angle that worked, and the van crawled up onto the main road. By this time, we had maybe two hours of daylight left and close to three hours of steep mountain roads ahead of us. Most of our food and water was gone, and it was getting cold on the high plain. Nothing to do but press on, returning home on roads that we could recognize. Thankfully, we negotiated the high pass, crossed the 20-30 streams again, and rolled back into base camp by 6:30 to a hot dinner prepared by our ADRA host family. The dining room in Japura is also the kitchen, and the small room quickly warmed from the cooking and our excited re-hashing of the day. The meal and being back at camp seemed something of a miracle. In addition to getting back safely, we were thankful for other experiences today. Throughout the day, we were surrounded on all sides by jagged, icy peaks, and were fortunate that the mountains were almost never obscured by clouds. Also, spending the day between 15,000 and 16,000+ feet meant that our base camp in a valley at 13,000 feet now feels very warm, protected, and oxygen-rich. Tonight, we made a good plan for tomorrow’s work, and I’m excited to see the project site for the first time! I got the full download tonight from Jim, the other professional mentor on the trip, who has built many water systems around the world and has gotten this system off to a great start. My de-oxygenated brain is now full of catchment walls, galvanized-to-HDPE fittings, springbox design, concrete forming techniques, and a long list of things to “not forget.” This week will likely be short on engineering and long on general contracting: finding, organizing, and delivering materials to where they’re needed, negotiating the division of labor between us and local workers, and streamlining work as much as possible to meet the short remaining timeline. All of this has to happen at a site 1.5 hrs and 1,500 vertical feet of hiking above our base camp, with any trips to a store costing someone a full day. Basically, this is the part of the trip where most people would lose interest, while the eyes of the engineer light up at the challenge. I will have four and a half days on the project site this week, and the goal is to test the system and turn it on before I leave. It sounds like I’ll miss the celebratory dinner, which is ok with me since last year’s celebration included the much-loved delicacy of llama eyeball soup. What a treat.